Do you know a child who does not point or has not used words by the age of 14 months? Are you concerned about your child’s playing and thinking skills? Does your child show an interest in playing with peers or prefers to play alone? This is an early intervention service that focuses on a child’s overall healthy developmental skills in 5 areas of development (Communication/Language, Social/Emotional. Motor, Adaptive, Cognitive). Services cover ages 0-5 years old. For ages 0-3, services may be at NO COST through the Early Steps Program and are subject to eligibility. 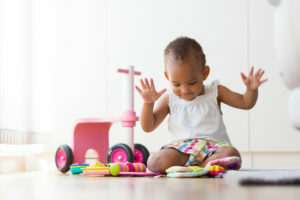 Developmental Therapy is a form of therapy that focuses on integration of conceptual skills, motor skills, language skills, and social-emotional skills. It includes a global evaluation and assessment, Individualized Family Service Plan development and family training. To achieve a comprehensive therapy treatment program Developmental Therapists establish a close relationship with a child’s family, therapists, and school to create an appropriate treatment plan and to support parents in the developmental process. Typically, Pediatric Developmental Therapy focuses on children ages birth to five years. Pediatric Developmental Therapists look at the child. It is a discipline that specifically looks at how a child is developing during the most significant period of the child’s development. Our Therapists assess a child’s global development and identify specific areas of strengths and weaknesses. Thereafter, they develop play activities designed to help a child overcome their challenges and improve the quality their interactions. These activities help the child to gain confidence in their own ability to learn and to acquire typical day to day skills. Our therapists provide an umbrella that supports a child in all areas of development. This support is in form of training as part of the child’s everyday routines and activities. Our therapists will also assist a family in anticipating next steps in development. They guide and support parents in learning to observe and interpret your child’s behavior and follow your child’s lead in play. A child learns through the experience of play. They explore, interact, and copy what they see around them. A developmental therapist incorporates play activities to help a child improve in some of the global areas they may be struggling with. Parents, Teachers, Caregivers and Guardians are strongly encouraged to participate in the therapy treatment process. Services are provided in the home, school and community settings, the child’s natural environment.